On June 20, 2017, the signing ceremony of an inter-university agreement between the University of Malawi, Chancellor College and Hiroshima University was held at Lilongwe, a capital city of Malawi, East Africa. The University of Malawi is a top-level national university and the department of education belongs to Chancellor College which is a central campus of the university. The Graduate School for International Development and Cooperation (IDEC), Hiroshima University has rich experiences and knowledge in research of education development in developing countries. Particularly in Africa, IDEC has dispatched their students as the Japan Overseas Cooperation Volunteers to Zambia since 2002 and held a number of joint seminars with the University of Zambia as part of academic guidance and counseling to IDEC students every year since 2007. When Professor Baba and Professor Shimizu from IDEC were dispatched for the purpose of advising to SMASSE project in Malawi in January, 2015, they had a talk with the dean of the Faculty of Education, the University of Malawi and it was agreed that they pushed forward future interchange. Specifically, in 2015 and 2016, IDEC accepted as foreign students, a graduate and a lecturer of the Faculty of Education, the University of Malawi. In addition, a faculty member from the University of Malawi participated and made a presentation in a joint seminar at the University of Zambia in 2016. Thus, interchange with the University of Malawi in an academic aspect has been materialized. Furthermore, in 2015 and 2016, faculty members from prominent colleges of education including the University of Malawi, participated in the JICA-supported Knowledge Creation Program aiming at curriculum revision of the pre-service teacher education. As it was held at Hiroshima, it became an important milestone to accelerate relationships between both universities. 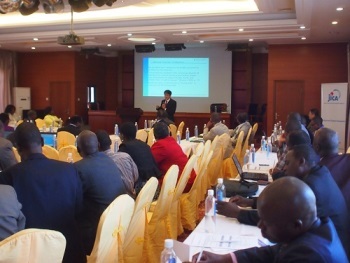 Professor Shimizu and Associate Professor Nakaya in 2015, and Professor Shimizu in 2017 visited Malawi as advisors to practice of action research, which was an important theme for the SMASSE project in Malawi during its latter half of the project period. At the action research dissemination seminar as an accomplishment of the project activity (※ 2), the signing ceremony was held in the presence of Prof. Samson Sajido, vice principal, the Chancellor College, the University of Malawi, and Professor Kinya Shimizu, IDEC, Hiroshima University and they exchanged the agreement. 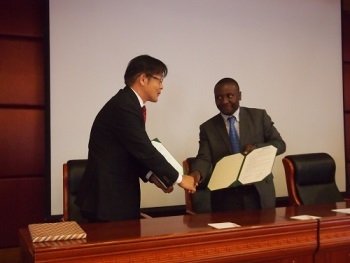 With this agreement, based on IDEC’ support to Zambia through the past technical cooperation and accumulated academic interchange with UNZA, it is expected that academic interchange in the field of education expands further through this regional mutual learning and joint research including Malawi. ※1 Zambia Education Program : A program to acquire master's degree in IDEC, Hiroshima University while teaching science and mathematics as the Japan Overseas Cooperation Volunteers to Zambia. The details from the following links. Please replace * with @.